" Swiggies was invented as an alternative to fanny packs and having to carry water bottles while exercising. This new hands-free approach is simple and easy to use. You just fill them up with water and go! They also make a great unique gift for anyone on your shopping list. " Do you worry about your kids staying hydrated during the warm summer months while playing outside ? I worry about my boys during the summer when they are outside during the summer 99% of the time in the heat. They are good ab out taking a water bottle with them to go play and ride bikes etc. but always leave them behind because it is hard for them to carry them around while playing. Swiggies has solved that problem ! 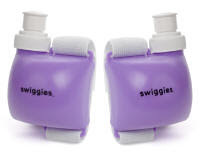 Swiggies was invented as an alternative to carrying water bottles while on the go. This new hands-free approach is simple and easy to use. You just fill them up with water and go! My boys enjoyed using them they also said they were comfortable to wear and DID NOT LEAK ! Each clever ly designed Swiggies holds 5.5 ounces of water or sports drink. It is strapped onto the wrist and has a pull top. It eliminates the need to carry water bottles, which can be cumbersome to carry and break your stride when you have to stop to take a drink. You just fill them up with cold water and go!! Both Swiggies supply you with the necessary 11 ounces of liquid to complete your workout without the risk of dehydration. Each Swiggies weighs a half pound, which is the perfect amount for running without putting stress on your joints. When they are filled with cold water Swiggies cools your wrists and keeps you from overheating. Swiggies makes a unique gift for any fitness minded person. Swiggies are safe for children. They are a "green" easy plastic to recycle product, made of the safest FDA approved, food grade, BPA-free plastic. You can also order Swiggies with your company logo. Swiggies promises you quick personal service and a quality product or your money back! Visit Swiggies, come back and tell us what color you like ! Ok, these things are awesome! They would be great for all the bmx'ing we do! So neat! I would love the Purple. Thanks for the chance at the giveaway. Purple would be the one I pick. How fun for my kids to take when we go hike the trail next to our house! I would choose the Swiggies - Blue. My daughter would love the pink Swiggies. Thanks. It would have to be purple. Thanks. I like the adult red. This goes on my gift list for one of my friends who geocaches! Love the orange for the kiddos! Thanks for the chance. Subscribed to Life In A House Of Blue. I would like the purple! Thanks for the chance!! My daughter would love the pink one. What a great product!!! I like Green the best! I like the blue ones. Thanks. I like the Swiggie in green! Great idea! I'd love the green ones! My son saw these somewhere and said he wanted some for when he is practicing for cross country and track. My daughter who also runs would love this for cross country camp this summer. I'd love to have the pink one for my daughter! It's all about the purple for me. I'd like it in blue! I Saw Their Site, I Like The Red, My Wife Likes The Purple. Thanks. Hope To Win! I follow you on twitter (lilshuga2001) and tweeted!! I FOLLOW ON TWITTER AND LEFT A TWEET. LADYHIGHTOWER. I'd love the blue Swiggies! I like Yellow, very cheerful! The blue one looks very nice!